I am continuing the battle to end the saga associated with 1 Stewart’s Place, Holywood which has remained in a perilous state of dereliction since July last year, resulting in the closure of the adjacent Bangor Road. 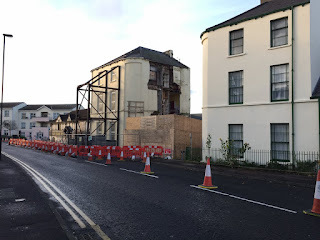 After successfully bringing my proposal to Council late last year requesting officers urgently bring back a report on options available for statutory intervention to enable full re-opening of Bangor Road further developments have occurred. I understand that the site has now been sold and specialists engaged by the new owners to examine how the building may by fixed with plans now due to the submitted which will result in the road being fully re-opened. Officers are also actively considering serving a notice requiring action to address the condition of the building within a specified period of time. Whilst these developments are welcome I am not relenting and have also been pressurising Transport NI to exert their influence as the authority permitting partial closure of the road. A further report on the range of options available to Council will be tabled in the weeks ahead including hopefully the option to service an Urgent Works Notice which would involve Council directly intervening to fix the building and then billing the owner. Together via this wide range of actions I hope to see resolution of this disgraceful saga which has resulted in great inconvenience for local residents, visitors and detrimental impact upon local traders. Holywood has had enough and needs the road re-opened and building sorted without any more delay and buck passing.